White Wednesday | The Happy Wonderer ~ ellen b. We got these photos from our dear DIL from Addy’s fun in the snow. I love how her tongue plays a part in her concentration. She loves being outside in any weather. On Tuesday we got piled with snow. It started snowing in the morning and didn’t let up until 4pm. We will have a white covering for a while yet. Our kids in the Seattle area measured 16-17 inches of snow! That is quite the event for Western Washington. Some establishments ended up closing early to let their employees head home. School buses ran normally on our road. February snow isn’t the norm around here and we’ve had light snow until now. Posted on February 13, 2019 by Ellen •	This entry was posted in Addyson May, Grandchildren, Snow, Weather, Winter and tagged Addy 22-1/2 months, February Snow. Bookmark the permalink. …White Wednesday with a splash of purple. Love the middle picture of Addy. She was certainly concentrating on something! Love the color of her snowsuit! I thought about your kids in the Seattle area yesterday when I heard on the news about how much snow they were getting. That is quite a bit of snow they ended up with! She made me smile! Love that little tongue was there a little drop she was catching. So cute in mauve against the white snow. Aw! Cutest little snow-bunny! The snow is crazy this year! 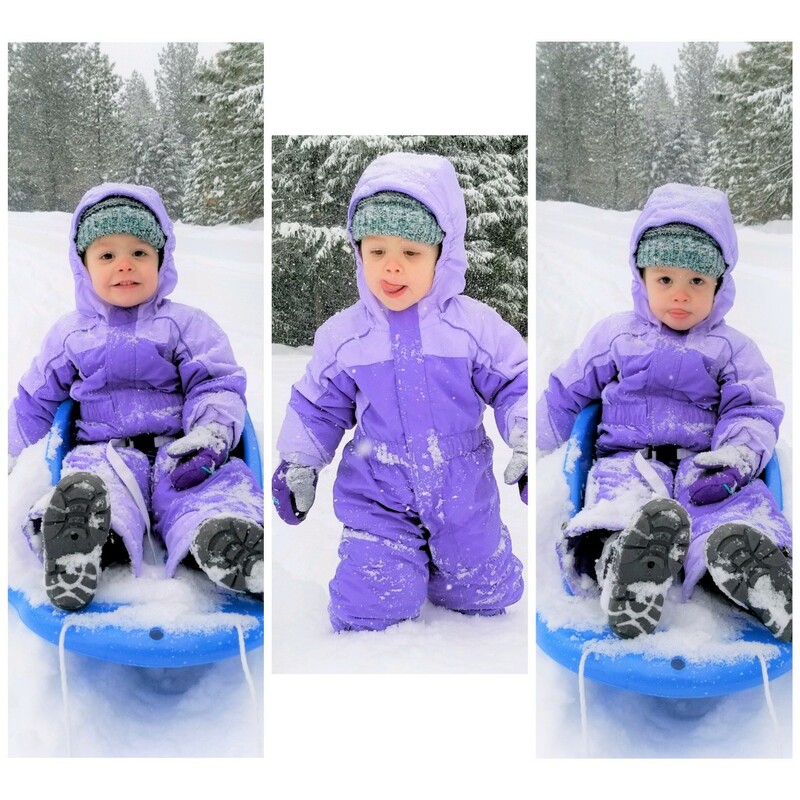 Love the photos of Addy having fun in the snow and what a cute purple snow suit!